Demonstrating his focus and yellow belt skills. Checking out his new gold belt. 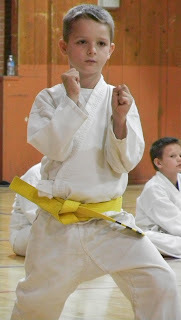 hard and to have achieved one more step towards his black belt. He looks so proud! Bet your grin was just as big! What a little cutie! No wonder you are so proud.